Made this yesterday, it’s rather nice albeit also rather rich! The pastry is the standard pate sucree recipe, blind-baked for 20 mins at Gas 4, to which you add pieces of apple which have been sweet-fried after being coated with lemon juice and cinnamon. The whole thing goes back in to the oven at same temp for another 20 mins before coming out to cool. In the meantime, make a nice dark caramel sauce, let it cool, whip up a tub of double cream and add your caramel sauce to the whipped cream, before spooning it all on top of the apples in the tart. The apples retain sufficient texture as well as their own flavour, enhanced by a gentle cinnamon buzz, although have to say that the caramel cream is the highlight and rightly dominates the overall mouth experience. Prepare 1 portion of pate sucree. Grease and line a 9 inch tart tin (use one with a removable base I’d suggest). Roll out your sweet pastry to a thickness of approx 4mm and place it into the tart tin, carefully filling the shape of the lined tin without stretching or tearing the pastry. Trim the sides, then place a large piece of greaseproof paper on top of the pastry, so that it also follows the inside edges of the pastry, and add ceramic baking beans, so that when you part-bake the pastry (using a technique called ‘blind baking’) the shape of the tart will be preserved and the bottom of the pastry won’t balloon up under the heat. ‘Blind’ bake the pastry for 20 mins, then set aside, still in the tart tin, while you prepare the filling. Take a heavy-bottomed saucepan, heat up the caster sugar with a tblsp of water until it turns a deep red colour. Take care with this as caramel is very hot and you should ensure you don’t directly touch it while making it. Soon as the sugar reaches this rich red colour, add the butter and mix just enough to incorporate it, then add the cream and heat up until you have a nice toffee coloured sauce. At this stage, remove from the heat so that it will still be liquid when cooled, which will take a while. Place the ground cinnamon and lemon juice in a large bowl, mixing together thoroughly. Add the apple pieces and mix so that they are well coated in the cinnamon juice mixture. Place a heavy-bottomed frying pan on the heat with the butter in it. Once the butter is melted, add the brown sugar and then the apple mix once the sugar has melted. Have the pan on a lowish heat and gently fry the apple pieces until the flesh has softened but the structure of the pieces isn’t breaking up. Take the blind-baked pastry tart, pour on the fried sweet apple mixture and return to the oven at gas 4 (180C) for a further 20 mins. Once cooked, remove from the oven and leave the tart, still in its tart tin, on a cooling rack. Beat the double cream until it forms soft peaks but not so that its becoming solid, then add the required amount of caramel sauce and fold it in to the cream. 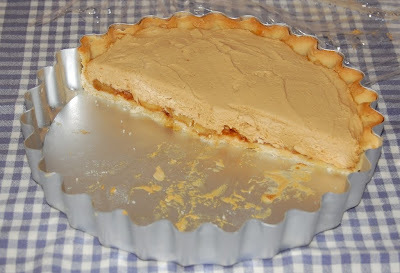 When the tart is sufficiently cooled, smooth the caramel cream over the apples, cover the finished tart and place in the fridge to allow the cream topping to firm up as it gets cold. Optionally decorate with glazed apple slices when serving. This entry was posted in caramel. Bookmark the permalink.